The thing for a comedy team to be successful, what people don’t realize, is that it involves a great deal of compromise. Creativity is a demanding lover and a loving task master. 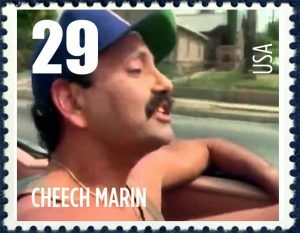 When Cheech Marin realigned his acting career following a string of successes with films home grown from comedy sketches about dope, among them the career making Cheech and Chong debut, “Up in Smoke,” he stepped away from the relationships and financial successes and into unknown territory. Cheech and Chong as a comedy duo was made from the moment, a tumultuous period of social and political upheaval, beginning in 1963 with the killing of JFK and coming to a hard boil, following the assassinations of his brother Bobby, US Attorney General, Medgar Evers, Martin Luther King, and in the East Los Angeles surrounds of his home, prominent Mexican– American journalist, Ruben Salazar. From a national cauldron of pain in the United States, Cheech emigrated to Canada, finding peace in the woods as a potter’s apprentice. Comedy is not funny, it is a radical act of disobedience and disappearance from the status quo, and in that light, we can see the connection and the tension between the times, the topics and the man. For Cheech, “Born in East LA” was the point of separation, where the man transcends his times and the expectations of those times, and through creativity becomes free. Cheech Marin was from a quick witted family where you had to be on stage to get a word in at the dinner table. His father was a cop, who, through a period of massive cvil discontent, rose up among the ranks of police administration in Los Angeles. He was not happy when son Richard Anthony Marin, nicknamed Cheech, dodged the draft and left the country for Alberta, Canada. The family was stable and straight in the sometimes volatile South Central neighborhood, and later in moving to the (whiter) San Fernando Valley. Cheech remembers South Central as being easier for him, racially, (as he expresses it) in a Biography Channel documentary about his life. Thoughtfully, father Oscar respected his adult son’s right to make the decision for himself, and Cheech was later granted immunity from federal prosecution and returned to LA. The dope comedy and films of Cheech and Chong that rode a rocket to fame in the 1960’s and 70’s, by the 1980’s, had played out. Cheech was Tommy Chong’s “straight man,” a disciplined achiever, and talented performer since childhood. Knowing this fact helps put what would come later into perspective, as Cheech relied on his analytical mind, rapid fire consciousness, and spirit of personal revolution, to re-find his audience and step, in the public’s eye, from being a performer in a role, even if based on his own improv abilities, to that of a guide and leader amidst a complex social and cultural environment. And “Born in East LA” was arguably the new beginning he sought, although Marin credits his voice acting in animated movies such as “The Lion King” and “Cars” with elevating his career. “Born in East LA,” is a parable about immigration that nails our current discourse and policies, because that’s what Cheech saw around him, that’s what Cheech lived among. And inequity and overcoming the stigmas of racism, is what, in the final assessment of the period marking the emergence of cannabis and cannabis humor in the movies, will be remembered alongside the long overdue changing of attitudes about weed. It is this inequity that sparked a response from the largest and as Cheech says wealthiest (“They had money”), generation. “Good luck” he says in an interview with High Times Magazine from July, 2018. Cheech came into the studio at High Times Magazine to be interviewed by David Burkart on a variety of topics. These short video clips provide an insightful understanding of the thought process of Cheech Marin, the man, and the artist, though the art of his own making. 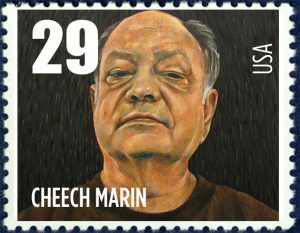 Cheech Marin, the artist, teaches us more radical acts, remaining faithful to the craft, and to the inner journey, from a time when many, not just a few, were shot down cold in the streets, when it was dangerous to be Mexican–American. The journey for some has been to escape. Here we might see in the same frame, Cheech’s escape from stereotypes, labels, typecasting, racial conflicts, cultural restraints, political myopia, the country as a whole, the fog of war, stoner roles, the cops, and finally, as understood through his works, time. But Cheech Marin’s cultural legacy is to be included. It may be reviewed and enjoyed through his personal collection and long embrace of Chicano Art, documenting the cultural perspective of Americans as a movement and as peoples, at the The Cheech Marin Center of the Riverside Art Museum.